What Exactly Is The 28-Day Keto Challenge? This book shares 38 recipes (10 breakfast recipes, 14 lunch recipes, and 14 dinner recipes), plus snack ideas and tips for successfully conquering cravings. It also comes with a 28-Day Meal Plan calendar, so you don’t have to figure out what to eat during the first month. In this book of the 28 Day Keto Challenge, you’ll learn how to calculate your optimal ketogenic macronutrients and keep the right ratios to sustain ketosis. You’ll know exactly how many carbs (including hidden carbs), fat, and protein you’re eating daily. When some people first start the keto diet, they experience flu-like symptoms. Fortunately, these symptoms don’t last long. In this book, you’ll learn useful tips for treating the symptoms of the keto flu. You don’t have to do intermittent fasting (I.F.) when you’re on the keto diet, but it can help speed up fat loss. This book will teach you the basics of intermittent fasting, including the benefits of I.F. and its five types. This book will give you advice on the best ways to deal with the social pressure associated with keto dieting. You’ll also get a chart with clever tips when eating out, as well as a few directions for drinking alcohol. 1. Keto Desserts – This cookbook contains 36 tasty and satisfying dessert recipes. 2. Avocado Recipes – Avocados are a crucial component of the keto diet. In this cookbook, you’ll learn five of the best ways to prepare avocados. 3. Keto Supplement Guide – In this book, you’ll discover 12 of the best supplements for making a keto diet more effective. This is just a bit of information on the 28-Day Keto Challenge. For more information about the seven guides and the bonus items, please check this page. Who has time to develop an organized and effective keto meal plan? Most of us don’t have the time and the expertise to do that. That’s why guides like the 28-Day Keto Challenge are a lifesaver. Of course, it’s still important to put in a little time to cook and prepare these recipes. The 28-Day Keto Challenge doesn’t only provide a meal plan, but it also helps you deal with social pressures that could sabotage your success. The tips for beating the symptoms of the keto flu are also helpful in making your transition into ketosis less stressful. When you purchase this meal plan, you’ll access more than 70 healthy and tasty recipes. Personaly, we really like the keto desserts and avocado recipes. With these recipes readily available to you, you don’t have to spend so much time searching for keto recipes and wondering about the amount of carbs, fats, and protein contained in them. There have already been preliminary studies on the ketogenic diet. Some of them yield positive results. For instance, a study published in the journal Experimental & Clinical Cardiology has shown the positive effects of a long-term keto diet on obese patients. It helped them to lower their body weight and body mass index (BMI), as well as lower their blood sugar, triglycerides, and LDL (low-density lipoprotein) levels. You have 60 days to test this meal plan. We think that’s enough time to determine if it works as promised. If you’re not ecstatic with the results, you can simply contact them and ask for a full refund. Some people still prefer physical books because they find it hard to download eBooks. Perhaps you’re one of them. 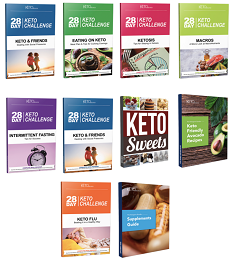 If yes, you might not like the idea that the 28-Day Keto Challenge comes only in a digital format for now (although you can always print all the material yourself). Is the 28-Day Keto Challenge worth your time and money? In general, we believe it offers great information that can be very useful for many people. What we really liked about this plan is that it does not only provide comprehensive information, but also includes lots of keto recipes. We think it’s best suited for people who are planning to get into ketosis but don’t know where or how to start. Overall, if you are looking for overnight results, if you have a medical condition that requires a specific type of diet and close medical attention, or if you don’t normally follow through with your diet, then the 28-Day Keto Challenge might not be for you. On the other hand, if you want a list of keto-friendly and tasty recipes, if you need help sticking to the keto diet within the first month, or if you simply want to enjoy the benefits of the keto diet, the 28-Day Keto Challenge is a great option to consider. Well, this is it for our 28 day keto challenge reviews. We sincerely hope this has helped you make the right decision. Click Here To Get Instant Access To The 28-Day Keto Challenge Now!